The Golden Knights ended the Crimson's ECAC playoff run, but Harvard still managed to clinch an NCAA Tournament berth due to its impressive season-long performance. The No. 12/11 Harvard men’s hockey team entered Friday’s ECAC semifinal clash with No. 9 Clarkson looking to avenge last year’s defeat in the same round. The Crimson (19-10-3, 13-7-2 ECAC) fell short, though, bowing out to the Golden Knights (25-10-2, 13-7-2) by a score of 5-2 in the round of four for the second straight year. A poor start to the game set Harvard back in the early going, but the Crimson managed to cut Clarkson’s three-goal lead to just a single score a minute into the third period. This comeback effort, however, would fall victim to an unfortunate call and a bad bounce, ultimately rendering the contest out of reach for the No. 4 seed in the conference tournament. The Crimson entered the second intermission trailing 3-1 instead of 3-0 thanks to a tally from junior defenseman Adam Fox 14 minutes into the middle frame. The potted puck, which changed directions en route to the back of the net, put the game within reach for the Harvard icemen, who had yet to find their groove by the mid-way point of the contest. With the strike, Fox took sole possession of the program’s all-time record for most points scored by a defenseman in a single season. Mark Fusco ’83, a Hobey Baker Award winner in his own right, was the previous record-holder with 46 points in his senior year. Another offensive-minded defenseman brought the Crimson closer to knotting the game when, early in the third period, freshman Jack Rathbone bulged the net on a shot from the high slot. Rathbone now has at least one point in seven straight outings (3–5—8). Suddenly, after falling behind by three scores early on, Harvard had a legitimate chance of clawing all the way back to a tie game. But a spell of bad luck would halt the Crimson’s surge. 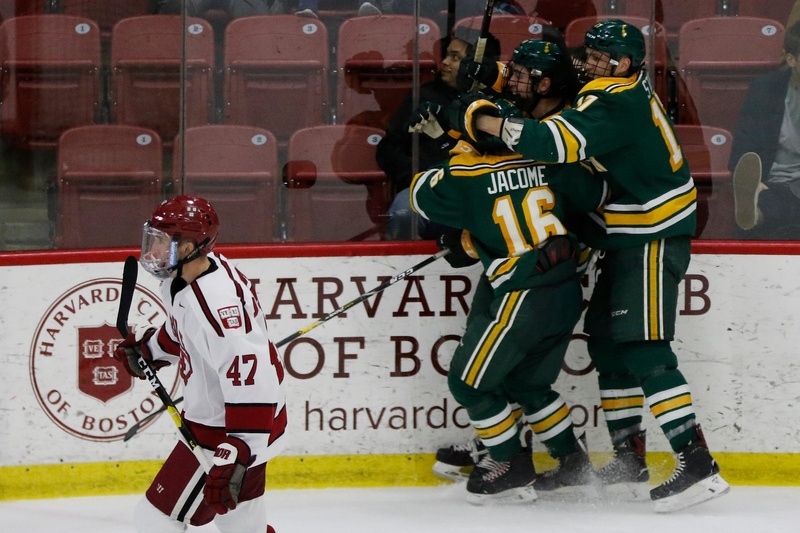 Seven minutes after the pivotal Rathbone snipe, Golden Knights sophomore Jack Jacome punched home a goal with his skate after crashing the Harvard net. Upon review, the officials upheld the call on the ice — a good goal — much to the disbelief of coach Donato and his bench. The margin returned to two goals, and the questionable call cut short any momentum the Crimson was riding after trimming Clarkson’s advantage to one. With just four minutes remaining in the final frame, the Golden Knights buried the dagger. Junior defenseman Jordan Schneider fired a shot from the point that ricocheted off Harvard defenseman Reilly Walsh’s stick, fluttered toward the goal, and beat confused junior backstop Cameron Gornet. For the Crimson, the resulting three-goal spread was insurmountable at that point. Frustratingly, both of Clarkson’s third-period marks were instances of the “Hockey Gods” siding with the Golden Knights and were thus relatively out of Harvard’s control. Harvard’s lackluster start forced it to play from behind almost from the very beginning of the contest. By the 5:13 mark of the opening period, Clarkson already owned a two-goal lead. Three minutes into the tilt, a faceoff in the Crimson’s defensive zone went sour. Golden Knights junior Haralds Egle found twine on a wrist shot from the high slot. Classmate Nico Sturm, one of the elite two-way forwards in college hockey, won the draw cleanly, setting up Egle’s 18th tally of the season. Sturm and Egle finished the night with two points apiece, as did Schneider courtesy of a fortunate bounce on the final goal of the game. Clarkson carried play for the next few shifts, and the tilted ice continued to yield results. Freshman forward Anthony Callin followed up Egle’s strike with one of his own, putting home a loose puck after a scrum in front of the net failed to neutralize the rebound from Harvard net-minder Michael Lackey’s initial save. Senior net-minder Michael Lackey made his return from injury on Friday, only to be pulled in favor of junior Cameron Gornet mid-way through the contest. For the Crimson, focus remained intense and spirits high, but the excitement of competing in the ECAC final four quickly faded to the reality of an early multi-score deficit. Lackey, meanwhile, was in the process of settling into his first game minutes since Feb. 16’s injury against, coincidentally, the Golden Knights. Two immediate goals against made it that much more difficult for the senior puck-stopper to regain the confidence and rhythm he possessed prior to his knee ailment. Lackey never truly settled into his crease, and coach Donato had little choice but to pull his senior goaltender in favor of Gornet. Thirteen minutes into the middle stanza, Clarkson freshman Nick Campoli sent a wrist shot toward the cage from just over the blue line. The seemingly low-threat attempt squeaked through Lackey’s pads and dribbled over the goal line. The savable shot proved to be the game-winner. While the skaters in front of him also left something to be desired through the first half of Friday’s affair, Lackey simply was not providing the high-caliber goaltending required to knock off a top-10 foe like the Golden Knights. 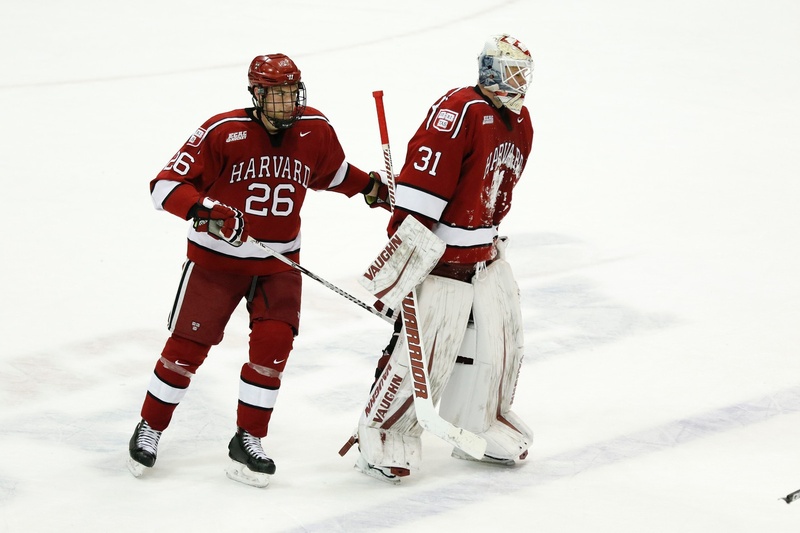 Gornet, whose solid performance during Lackey’s month-long absence (5-1-0, 1.83 GAA, .938 SV%) allowed Harvard to continue its high level of play, once again received a chance to prove himself. Despite the loss, Harvard’s season did not end on Friday night, as it did last year with a conference semifinal loss to Clarkson. Shortly after the final horn, the team was made aware that it had clinched a spot in the NCAA Tournament, a 16-team league-wide battle for the top spot in college hockey. After No. 4 Minnesota Duluth’s handling of No. 5 Denver in the NCHC semifinals on Friday, the Crimson’s at-large bid to the big dance was solidified. The program will return to the NCAA Tournament for the fourth time in the last five years and the seventh time under coach Donato’s leadership. The defeat still stings, though, especially among veteran Crimson players. Harvard will await the official draw of the NCAA Tournament to determine its regional semifinal placement and opponent for next weekend.